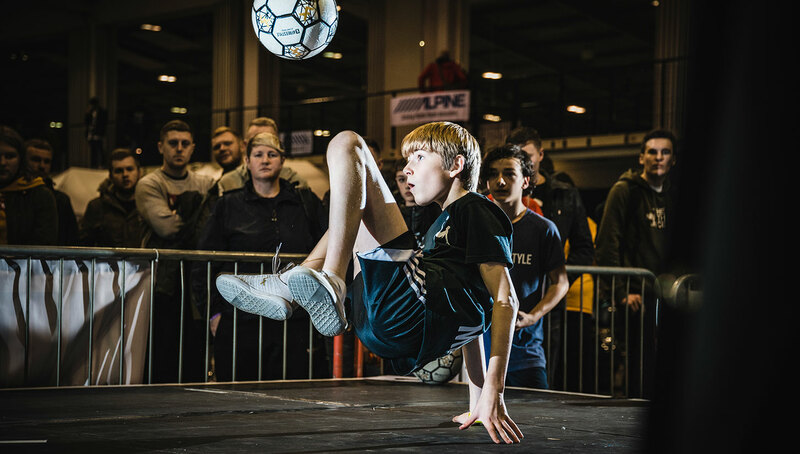 For the majority of freestyle football tournament crowds, the agenda is simple — attend, enjoy the show, and get home safely. But for the ones putting everything together, things can get a little hectic. 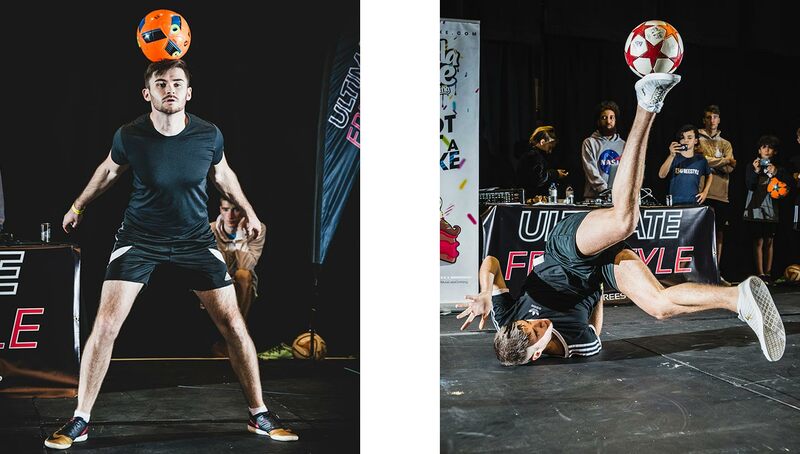 Pro freestyler and Urban Pitch contributor Stephen Gray got that experience firsthand, when he planned and facilitated the Ultimate Freestyle competition. He recounts the headaches, nervousness, and moments of enthrallment in putting together the successful event. 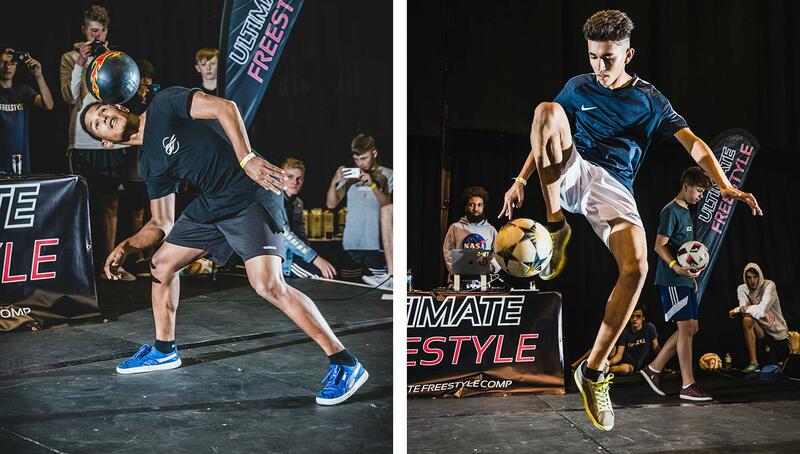 For many years, freestyle football competitions have been few and far between here in the UK. 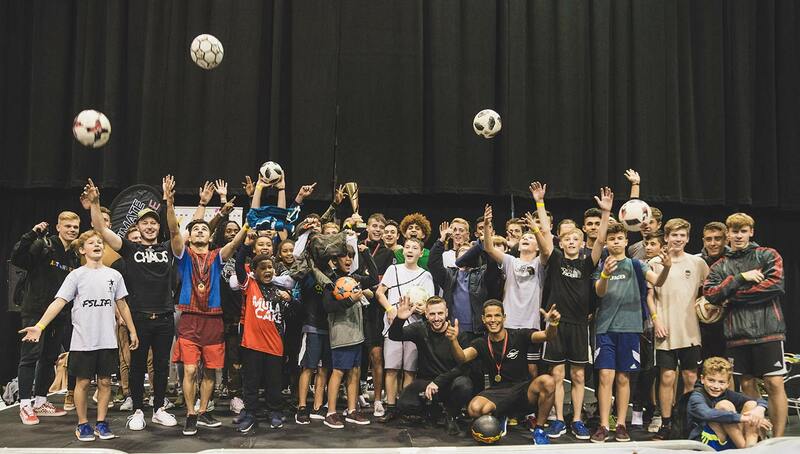 Quite often the UK and Ireland Championships are the only one, and people would have to travel internationally to compete in tournaments such as Lubasz Freestyle Night, European Freestyle Football Championships and Super Ball. Compare it to a country such as Poland that has lots of different competitions throughout the year, and you’ll soon see there is this gap in the UK freestyle scene, especially in the wake of AFFO’s disbandment. But some months ago, I, alongside pro Welsh freestyler Ash Randall and European flatland BMX champion Keelan Phillips, had a big opportunity to contribute something towards the UK scene fall into our lap. Ultimate Stance is one of the biggest annual modified car shows in the UK where ‘petrol heads’ would gather from afar to see these crazy and valuable vehicles in all their shiny glory. Having performed at this event for a number of years, the organizers asked if we would like to do something different this time as the urban entertainment we were providing was already going down well. 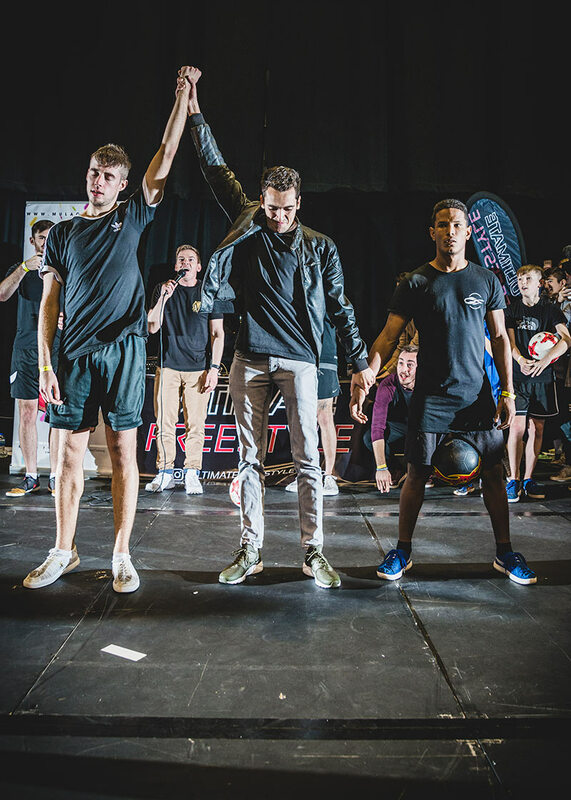 We had a venue in the Telford International Centre and that the staging and lighting were already in place, meaning two of the most daunting aspects of putting together a competition were already checked off. We agreed to put together a tournament because of this — but we had no idea of what we were getting ourselves into. Just like these articles that I write, getting started is always the hardest part. We had no idea where to begin, but we knew that with the help of the right people we could make it happen. Naming the event was easy. 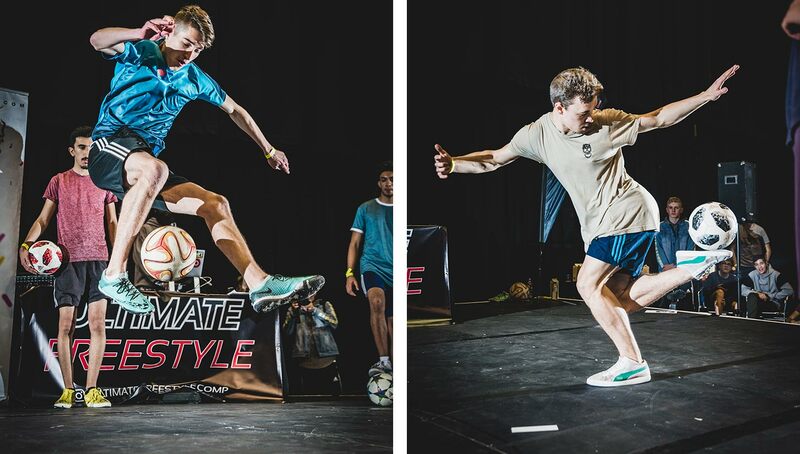 As we were an accessory to the Ultimate Stance event, “Ultimate Freestyle” was a rather effortless and natural fit. The challenging part would be tackling the aesthetics — the branding, theme, marketing, and image. We had some great ideas in our heads, but truth be told we were well out of our depth for turning ideas into realities. So we utilized the help of Czech freestyler and graphic design wiz Jakub Nekuda, aka Neky, who created all our graphics for us. This included the logo, some edits for social media, the flyers, and the posters, all of which helped to instill the desired thunder and lightning theme along the way. This process was a constant back and forth of fine tuning until we had things just perfect, and it was an absolutely essential part to selling and creating hype around our event. And for a while we had a really good thing going, carefully planning what to post on the Instagram page which was the hub of all information and details for the event. It was growing slowly but steadily and the engagement indicated people were excited and that we had their attention. While this was obviously good for us, it came with its fair share of headaches. Every day for three months Ash and I went through an absurd amount of phone calls to each other while also having to respond to every single person’s questions and messages through the account. Once we had the foundations in place it was a race against the clock to spread the word, get sponsors involved, and have everything perfect in place for the date of the event, November 4. Understandably, we had to make some big decisions with how to spend the initial small budget that we had been given. It could only stretch so far and we wanted to use a nice chunk of it as prize money for first, second, and third place. So with a beautiful PDF package put together by Ash we tried our best to secure sponsorships from various companies from around the world. We got off to a good start with Benefit Drinks and Nakd/Trek wanting to get involved offering us free products for the event. Relatively healthy snacks and drinks for the event is all well and good but we needed more for prizes also. Fortunately, we had Urban Pitch send us a set of shirts (which unsurprisingly set me back a fair bit with a whopping £63 customs charge). The real savior came late on when Mula Cake Clothing, an independent streetwear brand based in London, decided to sponsor the event. They were the only one who pumped in some additional fees which really helped to fill some gaps for us. This included a photographer, printing off more posters and flyers, water for the athletes and a videographer for the day. 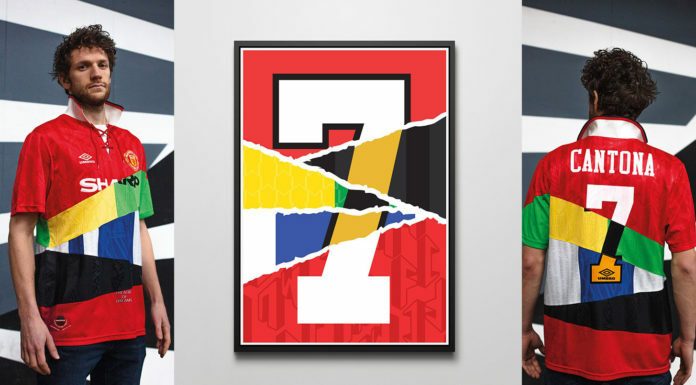 As the day of the tournament drew closer, we were tasked with putting together the little yet often overlooked details that many don’t even think about, all of which cost not only money but a significant amount of time. One example is how I had to summon all my limited arts and crafts skills to make scorecards for the judges. Another £15 and two hours of your time gone there. We also had to go visit a trophy shop and not break the bank on one that didn’t resemble something you give to a Sunday league footballer for man of the match. One of our biggest decisions to make came about three weeks before the competition, where we ran into a bit of a conflict with the overarching event Ultimate Stance. They were set to have their usual auction of car products on the main stage at a certain time, the exact same stage where we wanted Ultimate Freestyle to take place. With our desired tournament format, they were extremely likely to clash. The choice was either create a format that worked around them to ensure no conflict, or move halls and do everything independently. The latter would mean an even smaller stage, not being able to use the DJ they had booked on the day, and potentially less people in the crowd as we weren’t in the main hall. But we braved it and that’s exactly what we went for. We wanted to have the freedom to do what we wanted to and to not feel rushed, even if that meant no DJ. While we seemed to be securing a lot of the things behind closed doors including judges and entertainment acts, one challenge that was a constant for us was the planning of the actual freestyle side of things — the format, the numbers and the logistics. The biggest part that nobody tells you about being behind the scenes is the absolute mountain of printed off sheets and checklists that we had sprawled out in front of us in our hotel room. We spent so much time moving players around qualification circles because people had pulled out of the competition or told us they were going to be late. It never ended. Another huge challenge for us was that we didn’t have access to the venue until the day before the event. We didn’t know the size or surface of the stage, and we couldn’t actually promise anything to the participants experience-wise until we checked out what the venue looked like. Even when we were granted access on the day before, we were halfway through setting up the stage and warm up area before we were told by security that everyone had to leave the venue. We went back to the hotel knowing we had much to do the morning of the event before the freestylers arrived. Come nightfall I just lay there, one of my worst sleeps at a Premier Inn Hotel ever. Got about one-and-a-half hours max. I was more nervous than if I was competing. Then the day had finally come. We were so on it from start to finish. We managed to get our own DJ in the end who provided some great tunes, and our man on the mic Dave Clarke brought a real constant energy to the event doing his best to glue everything together. 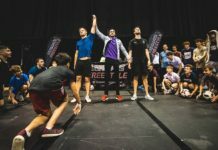 The judging panel, formed of John Whetton, the first-ever UK freestyle champion, John Farnworth, a household name in freestyle and a master of control, and myself slotting in between them as head judge, were genuinely loving what we were seeing. 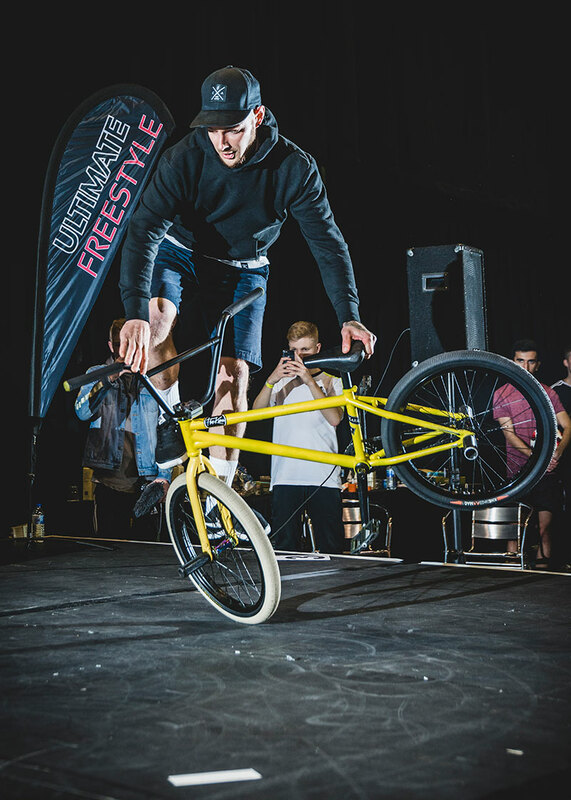 It was great to see so many new faces in freestyle, including 37 competitors and eight different nationalities all doing their thing on stage in front of a good-sized crowd, which we managed to maintain throughout the day as well. The atmosphere was incredible, everyone was really going for it and getting up close to the action where possible. We sadly lost one young freestyler due to injury early on, and we were struggling at first to get to grips with our timer for the battles as well. We had a few issues with sorting out the elimination circles and due to technical issues were unable to provide a live stream on the I AM A FREESTYLER Facebook page like we were intending to do so. However, eventually we felt comfortable and before we knew it we were in the home stretch — the Top 16. We somehow found ourselves back on schedule, and the light at the end of the tunnel was growing brighter. To really make it a show of it as well, we had some fantastic urban entertainment acts in between the various stages of the finals to give the competitors a small break. Organizer Keelan Phillips hopped on his bike and circled around on it daringly at a about million miles per hour. We had an international body popping champion in Taiwo “Showtime” Bamaduro and we also had one of the UK’s up-and-coming beatboxers in Crmpts, which all blew the crowds away. The eventual winner was Ireland’s Conor Reynolds who was consistent in every round, especially with his strong lowers. Reynolds just edged out Wiwi (France) in an awesome final which saw the Frenchman pull out some of his own insane handstand and breakdance style. Third place was awarded to Giannos (Cyprus) who was a constant crowd favorite and entertained throughout. 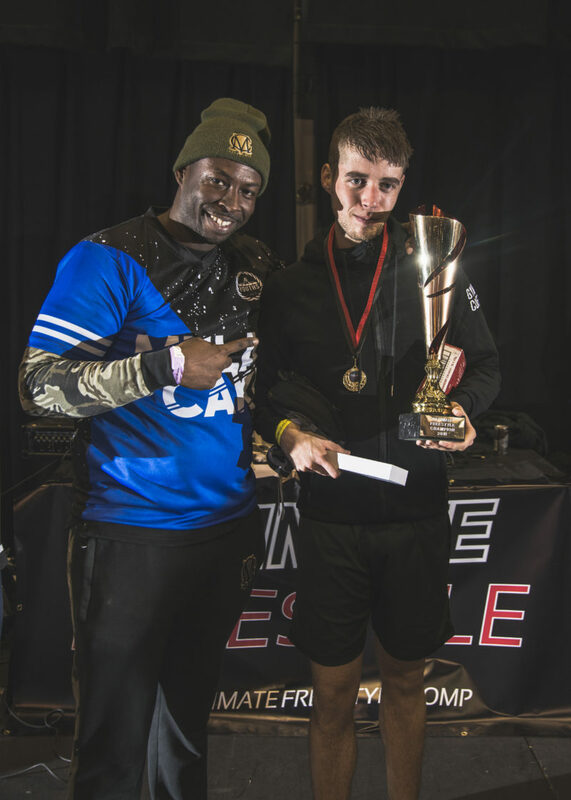 It was an amazing moment for me to do the arm raise and crown our first ever Ultimate Freestyle champion. My heart was racing and I hadn’t even kicked a ball all day! Overall the feedback from everyone — spectators, organizers, and freestylers alike — has been really positive. All the stress and planning was totally worth it. Was it perfect? Of course not. But we recognize how we can make it better if hypothetically it were to happen again, so who knows? This could be only the start of something incredible. Take the GOAL CHALLENGE and Win a Trip to Your Favorite Club’s City! 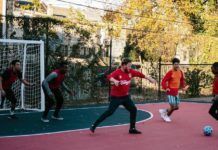 The Roundup: The Biggest and Best Upcoming Freestyle and Street Football Events! What If We Lost Neymar After the 2014 World Cup?